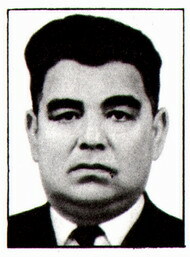 BAIMUKHAMEDOV, Hasil Nurmetovich (RU: Баймухамедов, Хасиль Нурметович) is the Soviet geologist, the academician of the Academy of Sciences of the Uzbek SSR (since the 1979; the corresponding member since the 1966). He is the member of the CPSU since the 1949. He has graduated during the 1943 from the Central Asian industrial institute (now the Tashkent polytechnic institute named after A.R.Biruni). He is the academician-secretary of the Department for the Sciences about the Earth within the Academy of Sciences of the Uzbek SSR (since the 1979). He has developed the principles for the metallogenic analysis, and the methods for the compilation of the forecast-metallogenic maps for the ore regions, zones, and provinces of the Central Asia.